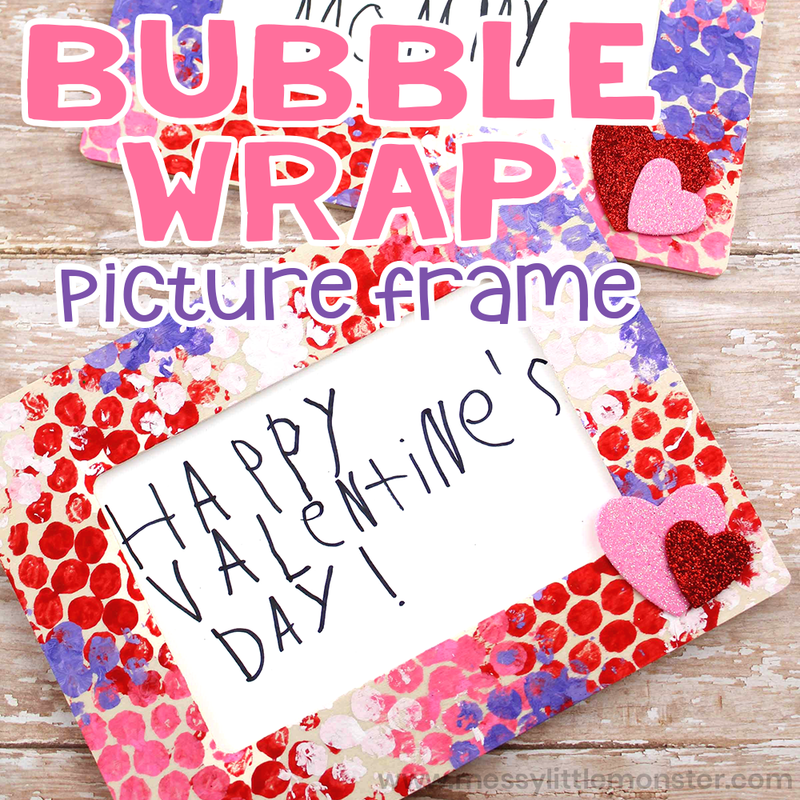 This bubble wrap painting picture frame makes the perfect Valentine's Day craft or Mother's Day craft. If you're looking for easy crafts for kids that your toddlers and preschoolers will LOVE this bubble wrap painting craft is the one! I mean, who doesn't love bubble wrap, right? Follow the step by step directions and have a cute handmade gift for a loved one. For more picture frame crafts, check out this handprint frame. This fingerprint poem is perfect to put inside a frame. 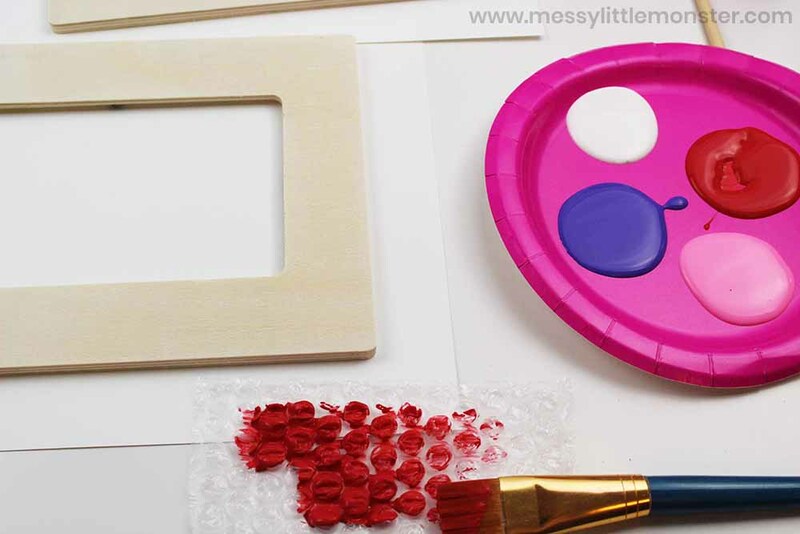 The painting technique used to make this bubble wrap picture frame is lots of fun and easy enough for the youngest of children to try. We love process art and bubble wrap painting is one of those painting processes that children of all ages love! 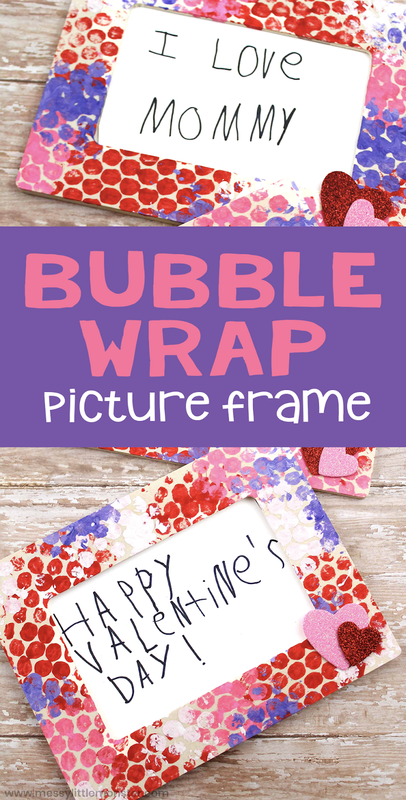 Whether you make this picture frame as a Valentine's Day craft, Mother's Day craft or just because you want to surprise someone, toddlers and preschoolers will love using bubble wrap to paint the frame and then gifting this to someone they love! Follow the step by step directions below to get started making your own bubble wrap picture frame. 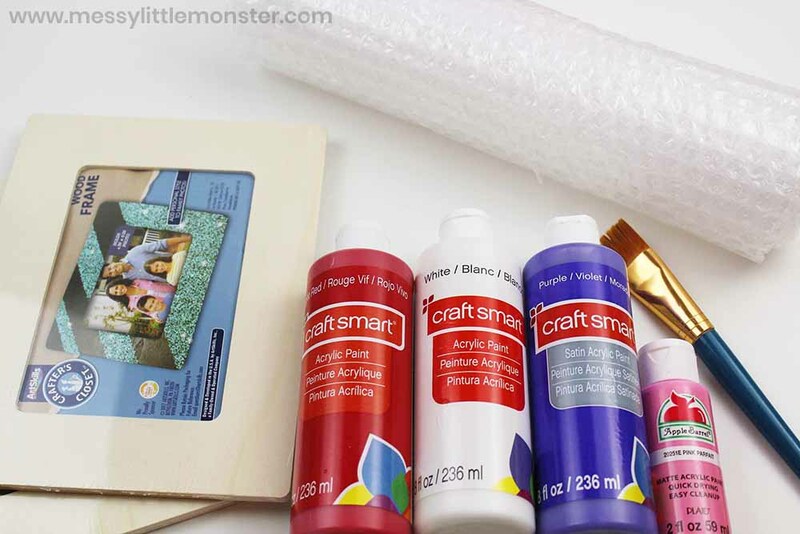 Before you get started, gather up all the supplies needed to make your bubble wrap picture frame. You will need to cut the bubble wrap into small hand sized pieces. Squirt a little paint in your chosen colours onto a small plate. If doing this craft with toddlers that are still putting things in their mouths you may want to opt for children's paint rather than acrylic paint. Be selective with your colours. I think 3 or 4 complimenting paint colours works perfectly. 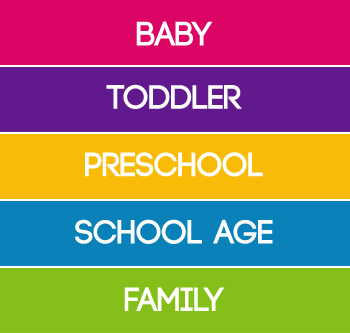 To get started, invite your preschooler or toddler to start painting the bubble wrap. They can either do this with a paintbrush or by dipping their bubble wrap into paint. 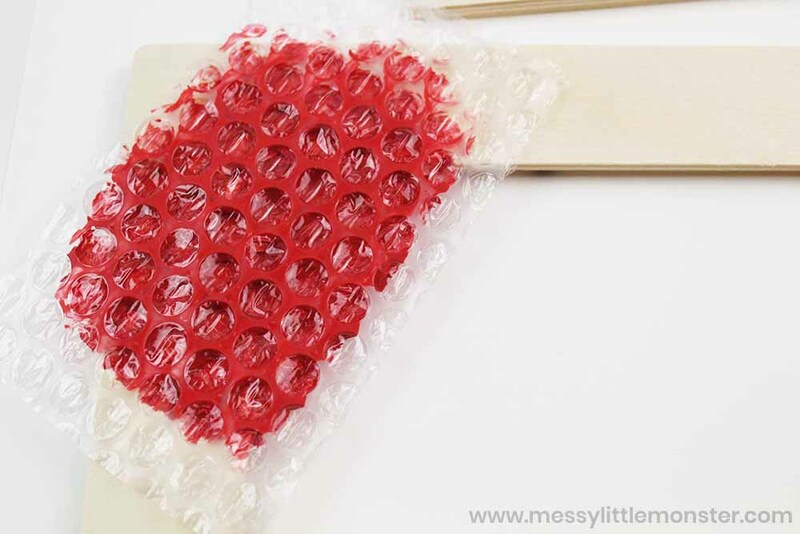 Next, place the bubble wrap paint side down onto the wooden picture frame and apply pressure. Continue with various colours until you are happy with the result. Allow the picture frame to dry. 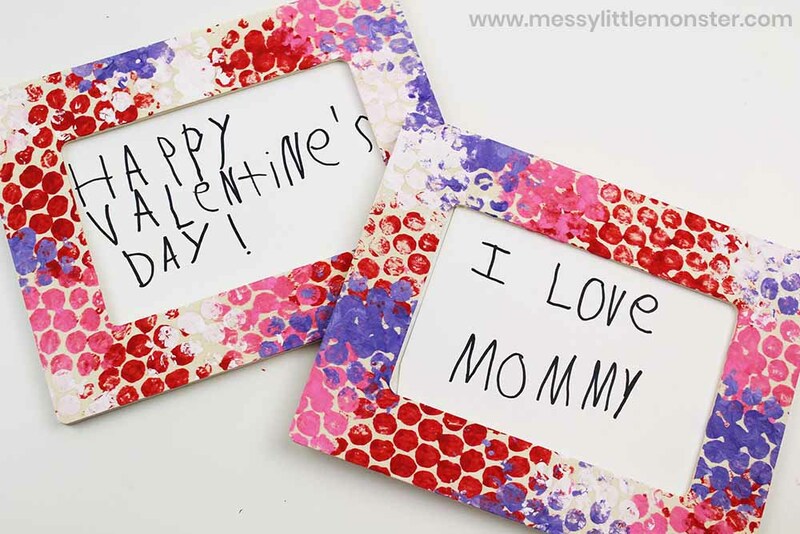 To finish up this picture frame craft, help your preschooler or toddler write a fun message on a piece of white cardstock and then place it inside the picture frame. 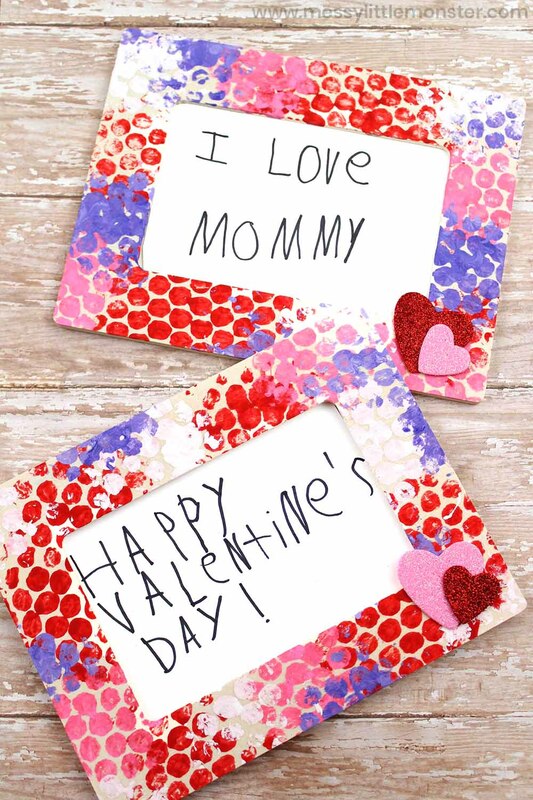 If they are too young to write a message you could write letters for them to trace over or add a fingerprint heart inside instead. Your photo frame is now ready to gift to a loved one! This is such a fun Valentine's Day craft or Mother's Day craft, but i'm sure it would be a very much appreciated homemade gift any day of the year! We hope you have lots of fun making this bubble wrap picture frame with your toddler or preschooler! Bubble wrap painting is so much fun and this bubble wrap picture frame craft makes a beautiful homemade gift too! 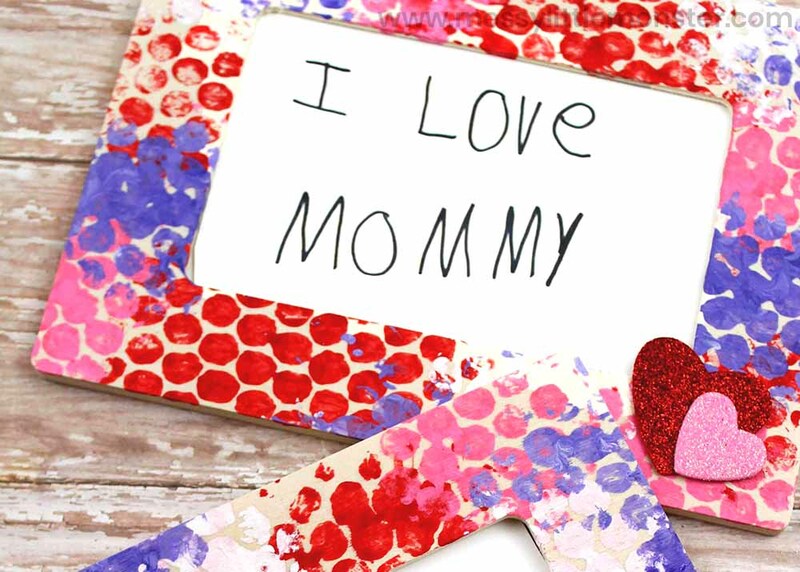 It's the perfect Valentine's Day craft - and an easy craft for kids too. Just watch your little ones beam with excitement as they gift this special craft.